Lehenga tips for the Summer Bride to stay cool & comfy! A summer bride has got a lot to worry about on her plate and even more when it comes to her wedding outfit. While it’s important to keep it fuss-free and follow the ‘less is more’ path, it’s still important to look her most stunning self. 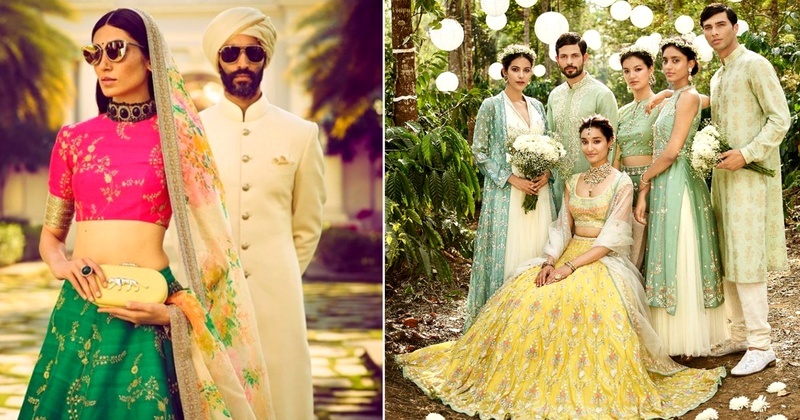 With the temperatures still rising with no signs of getting cooler, here are some really useful and easy wedding lehenga tips for the summer bride. Follow these and feel light and airy all through your wedding! Opt for outfits which aren’t heavily embroidered or embellished. The heavy work on an outfit not only weighs down the garment but also makes it difficult to walk around easily. So go for lightweight embroideries like mukaish work or gota patti, instead of choosing stones or zari. Try to shed some layers off your can-can, as it’ll only trap the heat inside the lehenga, making you feel clustered and hot! So, try opting for a lehenga without a can-can or the one that has a detachable can-can so, that you can remove it after the main ceremony is over. How about skipping the embroideries completely and opting for some beautiful, hand or kitschy printed lehenga that’s bright, bold and light? You’ll be that bold and fashion forward bride who dared to try something new and different! That's a biggie - whether to opt for double dupatta or a single dupatta look? Dupattas generally make everything a little more chaotic and cumbersome. So if it’s an outdoor event we say, stick to one dupatta! Because, two dupattas will mean more fabric, and that is sure to make you feel hot on your big day. Although, if it’s in a banquet you can totally opt for a double dupatta lehenga. Don’t choose a very dark colour, instead, choose the cool and soothing tones like pastels, mints, powder blues and corals. Apart from looking great they even give an illusion of feeling cool. Also, if you’re a summer bride and still want to opt for a shade of red, we suggest you try a coral red instead! How about getting your dupatta pre-stitched or get it in a cape style that goes with the look of your lehenga? It’ll give the outfit a contemporary twist and you’ll be so comfy in the scorching heat with one less thing to worry about! For every carefree bride who wants to keep it fuss-free and easy, this trick is going to be really, really useful! Opt for fabrics that are light and airy. Chiffons, georgettes and brocades are all lightweight fabrics that give maximum mobility. In fact, a tulle lehenga will also look really great, especially in pastel shades! They look right out of a fairytale. Time to experiment a little, girls! which is a big worry when you’re at your wedding! You can drape your gorgeous dupatta dramatically and no-one will know what’s beneath! A smart bride knows where to embellish your outfits and how. Instead of wearing a lot of heavy jewellery, you can opt for statement piece which’ll make you feel light and sweat-free! Summer brides-to-be, we hope you have noted down a few of these tips to not be all sweaty & tired on your D-day!